Do you believe that Ellen G. White is a true prophet of God? Do you believe that God can lie or use deception? Was God’s prophet shown what role God played in the creation of the 1843 prophecy chart? So the prophet of God was shown “in vision” that God guided, regulated, and governed the 1843 chart and that the pictures and the numbers were as He wanted them and were not to be altered! This is plainly stated on the surface so everyone should agree with this concept thus far. So how many mistakes? “A MISTAKE” – That is 1 mistake! How much did this “single” mistake affect the chart? So this single mistake affected some of the figures or periods – more than 1! Is this singular mistake portrayed on the chart itself? Now before you answer – remember, God directed this chart, and God never lies! So would God have “directed” a “figure” to be placed on the chart that He knew, was a lie? So the mistake was not in the numbers themselves that God had placed on the chart – but “in the reckoning” that arrived at those numbers – which was a mistake made by man. In other words, the mistake itself, that man made, is not displayed on the chart – only the numbers resulting from that mistake are. Now you may say that the number 1843 was a mistake – but was it? Answer: No it was not! God had the date 1843 placed on the chart because that date was a direct fulfillment of the “tarrying time” prophecy! Hab. 2:2-3 And the LORD answered me, and said, Write the vision, and make it plain upon tables, that he may run that readeth it. For the vision is yet for an appointed time, but at the end it shall speak, and not lie: though it tarry, wait for it; because it will surely come, it will not tarry. In other words, God made NO MISTAKE on the chart! He merely temporarily prevented man from discovering the mistake that they had made “in their reckoning” – which was not shown on the chart. What was this mistake that God had His hand over? The mistake was in calculating time periods from the beginning of the year to the end of the year. In other words, instead of starting on the first day of 457 and reaching to the very last day of 1843, the prophecy started in the autumn of 457, which would make the time period end in the autumn of 1844. This is called the “Full Year concept.” This mistake only added 7 months to the ending date for the prophetic periods that they had thought would end on the last day of 1843, thereby moving the ending date to 1844. This mistake was explained/corrected by God well before Oct.22, 1844. This mistake did not have any bearing on the “validity” of the time prophecies. The prophet of God specifically states that “the same evidence” that they had presented before “proved” that the time periods would end in 1844! Why would she specify “the same evidence”? Because God does not lie!! In fact, the prophecy in Habakkuk that the 1843 chart was a fulfilment of – specifies this fact! There are those who would have us believe that both the 1843 & 1850 charts were full of error. But they are not only teaching that the charts are “Lying” – they are, by default, teaching that God is a liar! The prophetic period that they are so viciously opposed to is the “2520” or “seven times” – which is displayed on both charts. When was the singular mistake explained? That means that the mistake was explained after the first disappointment of 1843 and well before the disappointment of Oct.22, 1844! So how can they say that the 2520 is the mistake – when it was again placed on the 1850 chart right along with the corrected date of 1844?!? And what did the prophet of God state about the 1850 chart that also included the 2520? In other words, those who opposed the Millerites, did not see the mistake either – and a quick reference to the writings of Miller and the other pioneers reveals that their opponents were trying to discredit the 2520 in the early 1840’s – proving once again, from the mouth of the prophet herself, that the 2520 is not the mistake! In fact, the pioneers believed in and taught the 2520 all the way up into the late 50’s. 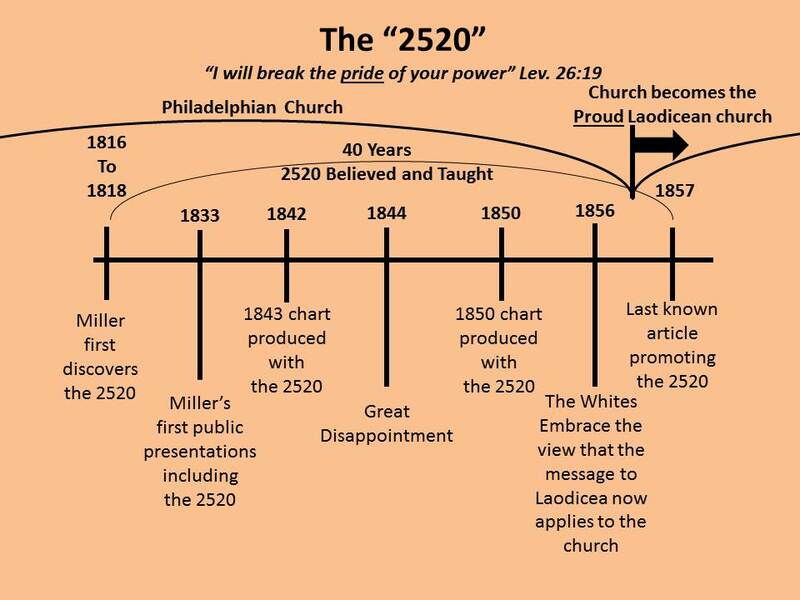 It is very interesting that the 2520 (whose purpose, among other things, is to humble the pride of God’s people) was abandoned around the same time period that the church becomes Laodicean! The “proud” who hate the 2520, like to promote the article against the 2520 from 1863 that was purportedly written by James White, as “proof” that it is a false prophecy. However, James White was just the editor of the Review & Herald, and a close examination of this article compared to all the previous articles written by James White, reveals a distinct difference in writing style. Could it be possible that someone created a “forgery” years later after James had died and pawned it off to God’s people? Has the devil used forgeries in the past to unsettle the faith of God’s people? Why would James White promote the 2520 all the way up into the late 50’s and then suddenly turn against it? Even if James did write that article, are we to ignore all the evidence for the 2520 based on that lone article? Nothing was to be changed on those charts – except by inspiration – and from all the studies of James articles, while I believe that he did a great work for God, I do not see evidence that he was considered inspired. Just some thoughts for you to ponder. We are to base our decisions from the weight of evidence! Out of over 180 hits in the pioneer writings for the 2520 prophecy, only a very few hits are against it. The vast majority are quotes that teach and promote it. Are we to throw out the dozens of articles and quotes promoting the 2520, and base our belief on one single article from 1863 (and Uriah Smith’s article 34 years later)? Those fighting against the 2520 claim that the word “times” that is in the King James Version is not in the original Hebrew texts in Lev. 26. But what does inspiration state? Not only that, but there is nowhere in the Bible that it states that the word “times” has to be present in order for it to be a time prophecy. For example, in Genesis 41, pharaoh is given two dreams, one with 7 fat cows and 7 skinny cows, and one with 7 fat ears of corn and 7 skinny ears of corn. The word “times” is not used, but the exact same Hebrew word for “7” that is used in Lev. 26 is used. And Joseph interprets those 7’s as representing years!! If Lev. 26 cannot be a time prophecy, then Joseph was wrong as well! It is more than significant, that it was Pharoah that did not understand the significance of the “7” – but Joseph understood what the “7” meant. The scholars who split the Bible up into man-made categories, like to claim that the 2520 is false because Leviticus is not a book of prophecy therefore there is no prophecy in Lev. 26! But are their claims correct? This means that the Bible from Genesis to Revelation is a prophetic book! But even if the reader disagrees with that statement, there is yet another piece of evidence that you must read. It deals specifically with Leviticus 26 itself. Please notice what the prophet of God says about Leviticus 26 – even quoting from it herself! Sister White just specifically listed the 2520 curse in Leviticus 26 as “Prophecies”!!!! Those who are fighting against the 2520, state that this prophecy has never been believed or taught by Seventh-day Adventists (believing in their mind that there were no Seventh-day Adventists before 1863). But this claim does not agree with the record! Then, in the mid 40’s, they added the “Seventh-day” Sabbath, and the sanctuary to the doctrines that they believed and taught. “Inquirer - When, then, do the people known as Seventh-day Adventists, date their origin? This means that from the 1830’s to 1845 – Millerite Adventists believed and taught the 2520 – then from 1845 to 1857, Seventh-day Adventists believed and taught the 2520! God Himself pronounced a blessing on those who had faith in this 1840-1844 message! This may be found in the “1335 days” time prophecy, which pinpointed the year 1843.